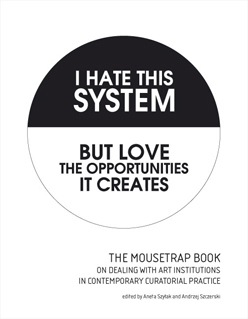 The Mousetrap Book: On dealing with institutions in contemporary curatorial practice is a book with the proceeding from the conference under the same title at Wyspa Institute of Art in Gdansk in October 15-16 2005 in collaboration with Buro Kopernicus in Berlin. The project was conceived and curated by Aneta Szylak and Andrzej Szczerski. The entrapment of the artists or the curator, and sometimes even the artwork, in the context of a complicated and structured institutional engine is more than a shared conviction. It is a commonplace. But there is a treat inside the trap that makes it also alluring and attractive. The questions we are asking concern the position of the curator working within the institutional structure and outside it. How can one overcome the obstacles of institutionalization? Are there any subversive strategies that allow the independent curator to collaborate with such a structure? What about an independent becoming a part or even the head of an institution? How can the artists circumnavigate the boundaries of an institutional framework? And what about new concepts and examples of institutions, anti-institutions or quasi-institutions? Cover illustration: Grzegorz Klaman, I hate this system, 2005, the project for Mousetrap Conference.